While Western analysts remain transfixed by China’s seemingly inexhaustible voracious appetite for the world’s hydrocarbon resources, a quiet green revolution has been taking place in the Celestial Kingdom. According to figures released last week by the China Wind Energy Association, last year China consolidated its position as the world's wind power leader in both newly and cumulative installed capacities, installing an impressive 17.6 gigawatts of wind turbines. Although the 2011 electrical generation figures were down 6.9 percent from 2010, by the end of 2011 the added production capability took China's cumulative installed wind power electrical generation to 62.4 gigawatts, up 39.4 percent from the previous year. 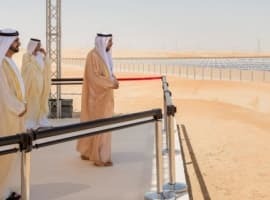 The decrease was due to the government bringing in stricter approval procedures for new projects following a series of major faults on its large wind bases. In 2011 Goldwind, China’s oldest wind turbine manufacturer, installed 3.6 gigawatts of new turbines, according to the figures from the China Wind Energy Association (CWEA), giving it a 20.4 percent market share. 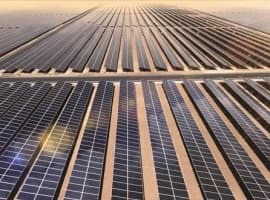 Previous market leader for several years, Sinovel, installed 2.9 gigawatts, bringing its 2011 share down to 16.7 percent from 23 percent a year earlier, while United Power, a subsidiary of state-owned utility China Guodian, brought 2.8 gigawatts online, bringing it into a close third place. 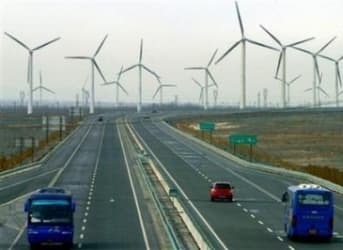 The top five Chinese provincial regions for newly installed wind turbines were Inner Mongolia (3.7 gigawatts), Hebei (2.1 gigawatts), Shandong 1.9 gigawatts), Ningxia (1.7 gigawatts) and Liaoning (1.2 gigawatts.) The newly installed capacity adjusted the ranking of China's top five wind power regions, in terms of cumulative wind turbine installation, to Inner Mongolia with 17.6 gigawatts, Hebei with 6.9 gigawatts, Gansu with 5.4 gigawatts, Liaoning with 5.2 gigawatts and Shandong with 4.6 gigawatts. Other Chinese and foreign wind power equipment producers included Mingyang, Dongfang Electric, Shanghai Electric, Vestas, China Creative, CSR Wind Power, GE, Chongqing Haizhuang, Yunda, Gamesa, Envision Energy, Silver Star Energy, Sany Electric, Xuji Wind Power, Huayi and Suzlon. 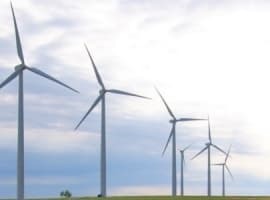 China’s accomplishment is all the more striking because, according to the Global Wind Energy Council, the United States, which previously led the world in installed wind power capacity, only installed 6.8 gigawatts of wind turbines in 2011, making its cumulative total 46.9 gigawatts by the end of the year. And the future? According to the International Energy Agency’s “Technology Roadmaps - China Wind Energy Development Roadmap 2050” report, China, already the world’s largest wind market, could be producing 1,000 gigawatts of electricity from wind power by 2050, which would reduce carbon dioxide emissions by 1.5 gigatonnes annually, an amount roughly equivalent to the combined CO2 emissions of Germany, France and Italy in 2009. Far from shunning foreign expertise, the “Technology Roadmaps - China Wind Energy Development Roadmap 2050” report is the first national roadmap that has been developed by a country with IEA support. Rather than go green for international plaudits, China’s turn towards renewable energy is driven by both economic and environmental concerns. Since China implemented its opening and reform policy 30 years ago, industrialization has brought in its wake increased environmental degradation. Acid rain, which in 1980 affected less than one tenth of China, now covers most of the country. Furthermore, over the next two- three decades, China will need more energy while reducing fossil fuel consumption while ensuring energy security, as most of its oil and natural gas is imported, making it subject to the vagaries of international politics and rising cost. 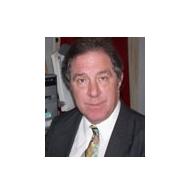 Accordingly, China’s best solution to power its ongoing economic growth is a transition to a clean, reliable, low-carbon indigenous energy system, which uses the most cost-effective and environmentally friendly technologies to improve economic development while ensuring competitive energy prices and high living standards. But it’s one thing to build more turbines – an additional cost will be revamping the nation’s electrical grid to carry the electricity from the remote regions where the bulk of the wind power is generated to the coastal cities where the need for power is greatest. A expensive tall order, even for a government with fiscal pockets as deep as China’s. Wind is free...wind power is not. For every new Kw of wind power constructed, one needs to build an additional Kw of conventional power to supplant the periods when the wind doesn't blow. This more than doubles the cost of each new Kw of wind power built. Of course, China can shut off the power when ever it needs to, i'm told. It is a completely false assertion that identical additional amounts of conventional power must be built when wind farms are built. It's simply not the case. Wind turbines are in operation most of the time, albeit at varying capacities. Areas of extensive wind farm penetration have learned to balance the energy coming into the grid. It IS a fact that complete backup plants are currently built for nuclear and fossil fuel power plants. So, even if it were true that additional backup was required, it would be no more than that for nuclear and conventional plants.